Donald Trump Jr.’s free speech defense is as bogus as it sounds. It’s as bogus as it sounds. Donald Trump Jr. walks offstage after Donald Trump’s debate against Hillary Clinton at Hofstra University in Hempstead, New York, on Sept. 26. 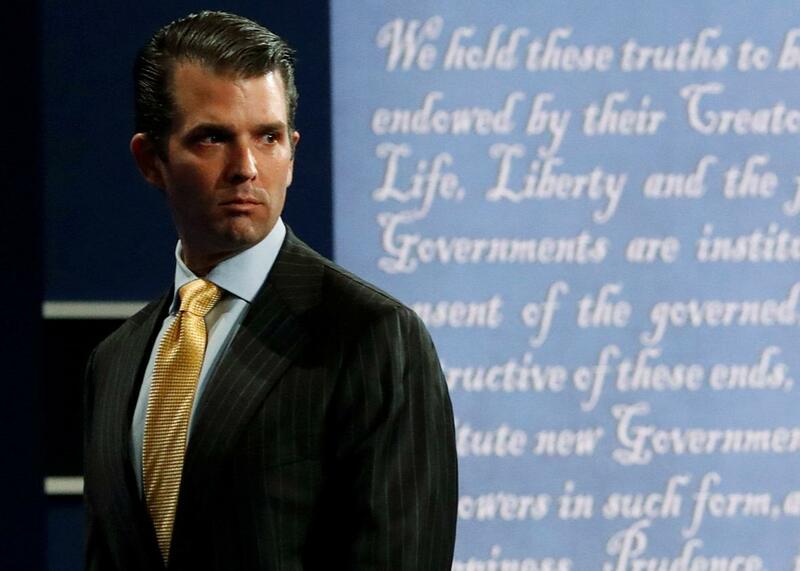 Get ready for the latest defense for Donald Trump Jr.’s actions: He had a First Amendment right to collude with the Russians to get dirt on Hillary Clinton. This defense, which has been advanced by noted First Amendment expert Eugene Volokh and others, posits that he cannot be charged under campaign finance laws for soliciting a foreign contribution because seeking and providing such information would be protected political speech, or at least protected for an American to receive. It’s a dangerous argument which fails to recognize the compelling interest promoted by Congress’s ban on foreign contributions: specifically guarding American self-government against foreign intrusion. It seems obvious that “I love it” constitutes solicitation in this instance. And there is a very strong argument to be made that “very high level and sensitive information” coming from the government of Russia is a “thing of value” for purposes of federal campaign finance law. The Federal Election Commission has said that providing free polling information to a candidate is a thing of value. It has said that when Grover Norquist’s Americans for Tax Reform gave a list of conservative activists in 37 states to the Bush–Cheney campaign in 2004, this was a thing of value which had to be reported by the campaign, even if the list was publicly posted on the group’s website. It said that Canadian campaign literature which an American candidate wanted to borrow from in his own campaign is a thing of value, even if its value is “nominal or difficult to ascertain.” It said that opposition research provided by a political group to Republican candidates can count as an in-kind contribution. And a federal court, in the prosecution of New Jersey Sen. Robert Menendez, said that a thing of value need only have subjective value to the recipient. In the case involving the Canadian campaign literature, the FEC said the solution was for the campaign to buy it at fair market value, not to take it for free. And in the case involving the polling data, the court distinguished between volunteering for a campaign—which is OK, even for foreigners—and providing things of value that the campaign would otherwise buy, including information. So here’s where the First Amendment argument comes in. Professor Volokh argues that applying the FEC statute against Trump for getting a Russian government oppo dump must violate Trump Jr.’s First Amendment rights because otherwise it would prevent all campaigns from obtaining mere “information” from a foreign individual. What if foreign individuals came forward during the campaign with dirt on Trump’s travails in Russia and gave it to the Clinton campaign? Would that violate the law? Could a campaign not even speak to a foreign individual? If a law is substantially overbroad, Volokh argues, it could be unconstitutional on First Amendment grounds against all people, including Trump Jr., even if a narrower law—for example, against taking information from a foreign government—could pass constitutional muster. Should it ever come down to a prosecution of Donald Trump Jr., I think courts would—and should—reject these arguments. One way to do so would be to read the statute more narrowly to proscribe actions like Trump Jr.’s: campaigns taking compiled information for free that they would have paid significant value to receive from a foreign source—or at least a foreign government. Campaign finance laws are usually justified on the grounds of preventing corruption or the appearance of corruption. But the laws barring foreign interference are different: They are about protecting self-government and the right of the American people themselves to decide who our elected officials and representatives are. As the FEC acknowledged in 2007, Congress passed and strengthened the foreign contribution ban with a broad scope out of a legitimate fear of interference in American electoral processes. It is a concern which has only been heightened by recent reports of Russian hacking into state voting and election systems in the 2016 campaign, as well as Russian proliferation of propaganda and Twitter bot–driven fake news and the country’s hack of the Democratic National Committee. Right after the Supreme Court decided the 2010 case Citizens United v. FEC, freeing corporations to spend money in elections independent of campaigns on the grounds that such independent spending cannot corrupt democracy, a Canadian lawyer living in New York named Benjamin Bluman brought a similar suit. He argued that his independent spending of 50 cents to make flyers and hand them out in Central Park in support of President Barack Obama should not be a crime because he could not corrupt the process. A three-judge district court, in an opinion by conservative D.C. Circuit Judge Brett Kavanaugh, roundly rejected the argument and affirmed the broad scope of the foreign contribution ban in Bluman v. FEC: “It is fundamental to the definition of our national political community that foreign citizens do not have a constitutional right to participate in, and thus may be excluded from, activities of democratic self-government. It follows, therefore, that the United States has a compelling interest for purposes of First Amendment analysis in limiting the participation of foreign citizens in activities of American democratic self-government, and in thereby preventing foreign influence over the U.S. political process.” The Supreme Court thought this result was so self-evident it summarily affirmed the lower court judgment without scheduling argument and without issuing a separate decision. That is how obvious the country’s interest is in preventing foreign influence over our elections. To let someone off the hook who solicited “very high level and sensitive information” from a hostile government because there may be cases in which information from a foreign source does not raise the same danger to our national security and right of self-government is to turn the First Amendment into a tool to kill American democracy. Put aside the incredulity Trump World would deserve if it pivots from saying there were no campaign contacts with the Russian government to acknowledging the contacts and saying they were just free speech. As a matter of protecting American democracy, the argument is pernicious and threatens the very core of what it means for “we the people” to decide who governs us.